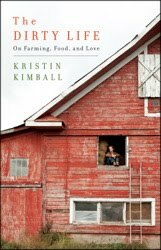 In The Dirty Life, Kristin Kimball tells the story of her transition from single Manhattanite to married rural farmer. The story starts with Kimball visiting an organic farm in Pennsylvania for a story she is writing. She shows up in designer jeans and high heels and is immediately put to work by her future husband. The work seems impossibly hard (especially in that get up) but after a few days, Kimball start to feel the pull. She likes the how her body starts to feel as a result of manual labor, she's amazed at the produce the farm produces, she is calmed by the purposeful "chores"...and she finds she's got a crush on the farmer. Within a few months, Kimball and the farmer (Mark) get engaged and decide to start a farm. The plan is that they will start a CSA that will be a "full diet" CSA. As you probably know, most CSA's have a vegetables, fruit and maybe some odds and ends (honey, flowers). This CSA would be different. It would be created to provide everything the share holder would need for their year round food needs. Meat, dairy, sweetener (maple syrup), vegetables, fruits, beans, grains and FLOWERS! As I was reading I was thinking-these people are crazy! The story describes their first year on the farm in great detail. Working 18 hours a day, everyday...broke, exhausted, snippy...it doesn't sound...idyllic. But then, like in most "back to the land" books I've read recently, they say it's worth it. The amazing food, the camaraderie, the connection to the land, the strong community, the sense of purpose. They say they couldn't imagine living any other way. And then I start to think-maybe it's the rest of us who are crazy. Definitely worth a read-especially if you have ever dreamed of farm life as an option! Would love to read it! I'll see if Talbot Co. Library has it! if not marina, i have it. My mom bought it for me. I can give it to you next time i see you. You'd like it.